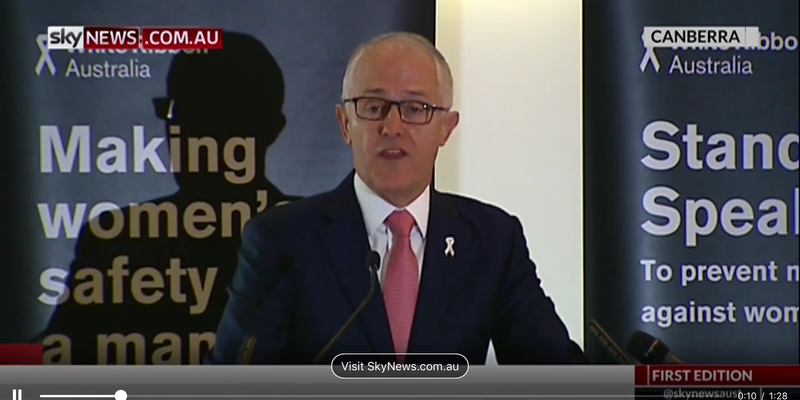 ” The Australian Government recently ( September 2016) announced a $100 million package of measures to provide a safety net for women and children at high risk of experiencing violence. The package will improve frontline support and services, leverage innovative technologies to keep women safe, and provide education resources to help change community attitudes to violence and abuse. One in six Australian women has experienced violence from a current or former partner, and 63 women have been killed so far this year. This will build on the $30 million national campaign (jointly funded by the Commonwealth, states and territories) to change young people’s attitudes to violence, which will commence in early 2016. Well thank you very much Nicholas and thank you Michael very much for your inspiring words. This is of course – this is a project that unites all the parties. And in a place where there is plenty of disagreement, it is wonderful to see the Labor Party, the Opposition, The Greens, the Coalition, Pauline Hanson, all sitting there together united in this one cause. Many other colleagues here as well. So I want to acknowledge everybody here. This is an issue that is not above politics, it is not beyond politics, it is something in which all of the participants from the political process are united and that is even more important. here today for the great leadership they’re showing. I also want to thank the founders of White Ribbon. I want to thank its CEO, Libby Davies, Nicholas Cowdery. I want to thank Telstra too for sponsoring this event. Most importantly, I want to acknowledge the victims of domestic violence and their families, whose courage and suffering we honour today. Yours are the faces and the stories behind the statistics that we are determined to change. Today, I recommit to my role as a White Ribbon Ambassador. And I encourage all men to wear a white ribbon as a sign of respect for women. As a sign that you do not tolerate violence or disrespect of women, and as a vow to stand up and speak out wherever you see it. 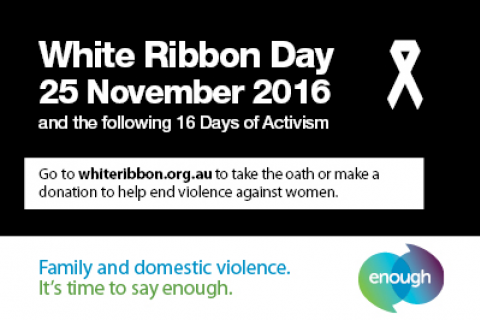 On White Ribbon Day, we stand together ‐ men and women ‐ and we condemn the actins of the few who commit domestic violence. And we call on all men to respect women and show that they abhor violence against women, to stand with us and say so. Yes, it is true that some men are victims of domestic violence. But the overwhelming majority of victims of family violence are women and children. And the overwhelming majority of the perpetrators are men. We know for Aboriginal and Torres Strait Islander women, they are 34 times more likely to experience domestic violence. That’ why all of us here today and many more men across the country are leading by example and calling out domestic violence for what it is ‐ a crime. Nicholas nailed it in his opening remarks –this is not a private matter, it is a crime. The term domestic violence which I suspect is too established to be dispensed with, is one that has the risk of minimizing what is a crime of violence. And it has to be seen and rejected and stopped as a crime. Now as Prime Minister, I have led a national conversation about the importance of respect for women. This is a key insight and one we must never forget. Now we can all make a difference. We can be better role models. That is critical, especially for us here as leaders. Whether we are leaders in business –I see Tony Warren from Telstra. Whether we are leaders of the Defence Forces or the Public Service or parliamentarians. All of us are leaders and we have to be role models. But above all as parents, we have to raise our sons from the earliest age to respect women ‐ beginning with their mothers and their sisters ‐ the women closest to them, the first women they meet, they learn to live with. They must be taught to respect them, and we must encourage and teach our daughters to have greater self‐esteem. Last month, I hosted the COAG National Summit on Reducing Violence against Women and their Children, with the Queensland Premier –it was the first of its kind. The Summit brought together First Ministers, Women’ Safety Ministers and more than 150 experts and leaders to reaffirm our commitment as a nation to stopping violence against women and children. There, along with my State and Territory colleagues, we launched a Third Action Plan, which had extensive community input, engagement and buy‐in. On this White Ribbon Day, may you be sustained by this solidarity and by the knowledge that we will not rest unti you are safe.